The legislation enables Arkansas to be the 27th state investing in Israel Bonds. Arkansas Gov. Asa Hutchinson (seated) is congratulated by Ambassador Ron Dermer after signing a pair of pro-Israel bills Aug. 14. Arkansas Gov. Asa Hutchinson signed two bills strengthening his state’s economic ties with Israel on Aug. 14. The first allows Arkansas to invest in Israel Bonds; the second prohibits state and local governments from contracting with or investing in companies that boycott Israel. Brad Young, the executive director of the Atlanta Israel Bonds office, and Art Katz, the Temple Emanu-El co-president who chairs the Atlanta Advisory Council, attended the signing ceremony, as did Israel’s ambassador to the United States, Ron Dermer. “Those are two very strong messages that, one, we ought to be open to invest in Israel as need be, and we should not have any restrictions on those investments,” Hutchinson said about the bills. 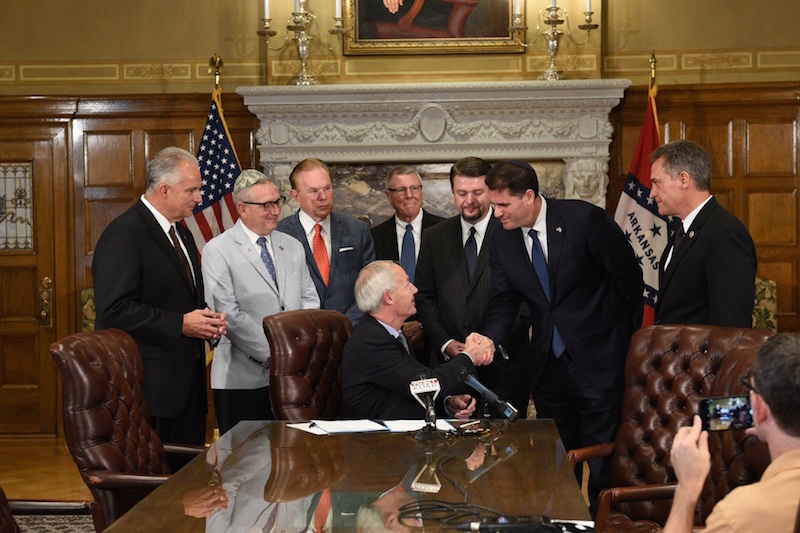 The legislation enables Arkansas to be the 27th state investing in Israel Bonds. Georgia, which has purchased the bonds for more than a decade, holds $10 million worth. Arkansas State Treasurer Dennis Milligan, whom Dermer welcomed at a reception hosted by local Jewish leadership, said he would like to allocate 1 percent of the state’s portfolio to Israel Bonds, which could mean a $30 million purchase. Ben-Gurion proposed bond investments in Israel instead of donations, but those bonds weren’t expected to appeal to institutional, non-Jewish investors. Not only has Israel overcome every challenge imaginable, however; it also has one of the world’s strongest, most resilient economies. After the global recession in 2008-09, Israel’s economy was among the first to emerge from the financial crisis. State treasurers, who are entrusted with the highest levels of fiduciary responsibility, have praised the value of investing in Israel Bonds. Beyond the investment value of the bonds, the Israel factor is also important. James S. Galfund is the national director of marketing and communications for the Development Corporation for Israel/Israel Bonds.